all the time I placate my beloved (in different ways)..
when she goes away, the heart burns..
with which fire has god made her? Enna Sona Kyun Rab ne Banaya Lyrics Meaning from OK Jaanu Movie. Story :A young artist (Aditya Roy Kapur) tries to win the heart of his muse (Katrina Kaif), while her mother (Tabu) hatches a scheme to end his quest for true love. Actors: Aditya Roy Kapoor, Katrina Kaif, Tabu. I wanna know how you feel right now..
Fitoor 2016 Hindi lyrics with meanings. Ek dhadkan boli tere liye..
a heartbeat said, for you. and made dreams out of them. created a new world, for you. I hear, I bear with, all for you. I walk again then, for you. tell me, what I am for you. tell me what I am for you. For this moment alone, I am here for you. Jisse choona chaahe woh tu dhuaan hai..
you are the medicine for every disease of mine. you are that prayer of mine that is granted (by God). is it love, or some intoxication, that which you want to touch is smoke. Let there be talks…let there be talks..
all alone.. let there be talks, of heart with hearts, let there be talks. for so long, a light fragrant morning stands at the door of the night..
Suno baaton se bantein hai baatein Bolo..
don’t leave me like that. Latest hindi song haminastu song from Fitoor lyrics with english meaning. here it is, here it is. it’s a sleeping fear here. we are used to this.. in this place. it’s mercy on us.. in this place. only the nests are there, in this place. 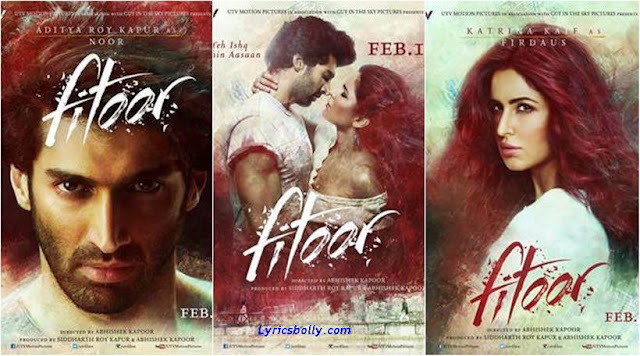 here it is.. here it is..
Fitoor Songs Lyrics with english translation. pashmina song lyrics in english and hindi with english meaning or translation. Actors: Katrina Kaif and Aditya Roy Kapur. Watch Yeh Fitoor Mera Full video song.